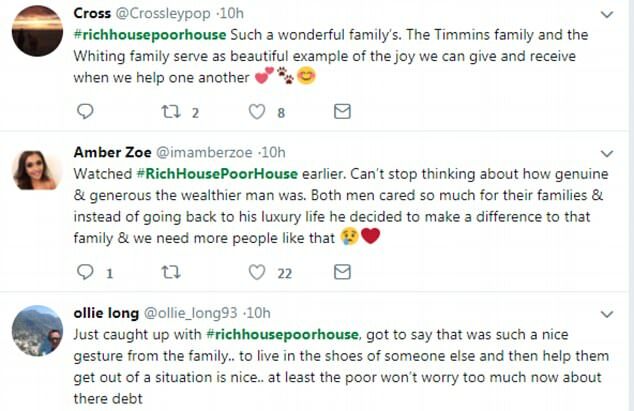 Viewers of Rich House Poor House were left in tears after a couple discovered their £11,000 debt would be paid off by the generous family they swapped lives with. 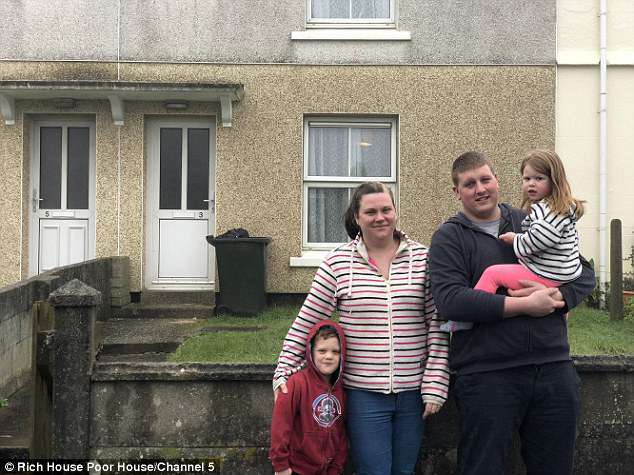 Part-time hairdresser Sarah Timmins, 29, and husband Ross, 28, a former Navy engineer from Redruth, Cornwall, were stunned after returning to their two-bed terraced home to find the life-changing gift. 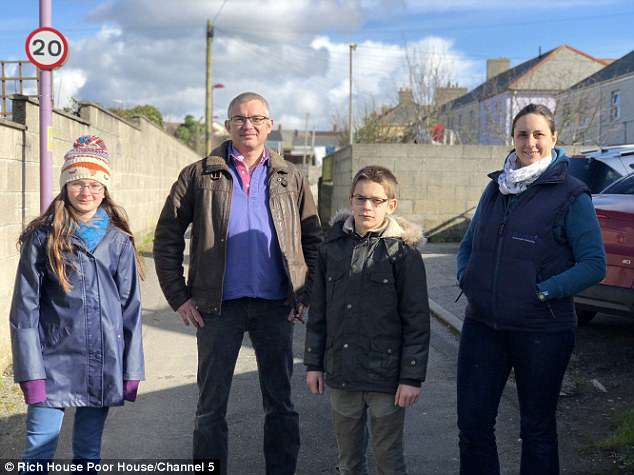 The Timmins and their two children, who usually survive on £122 a week, had swapped live with veterinary surgeons Colin and Lizzy Whiting as part of Channel 5’s television experiment. 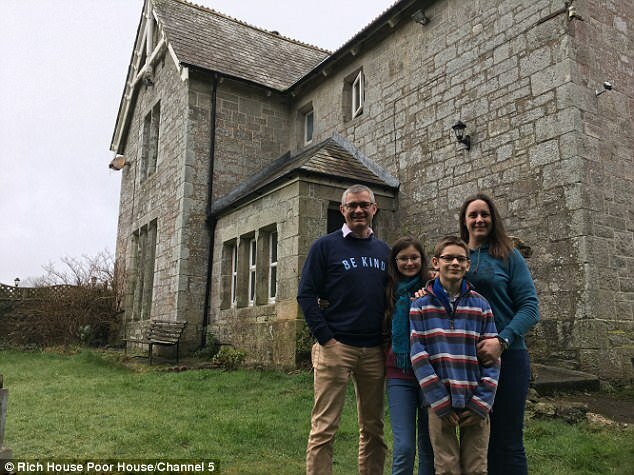 Their lives are in stark contrast to that of the Whitings – who live in a sprawling £700,000 farm house set on nearly nine acres of land and have a £1,235 weekly budget after rent, mortgage and bills. On returning home to find the generous gift from the Whitings, Sarah broke down in tears me as the weight of money worries lifted from her shoulders. Viewers were quick to react to the touching moment, with some saying they had been left in tears. One wrote: ‘Such a wonderful thing to do & will be life changing. Made me cry happy tears’. Meanwhile, one viewer commented: ‘Can’t stop thinking about how genuine & generous the wealthier man was. ‘Both men cared so much for their families & instead of going back to his luxury life he decided to make a difference to that family & we need more people like that’. In the letter, the Whitings explained: ‘Dear Ross and Sarah, we have learned how tough things are for you financially. ‘We would like to help you clear your credit card debt’. They also explained how they would like to help them to work towards saving up for a house deposit. 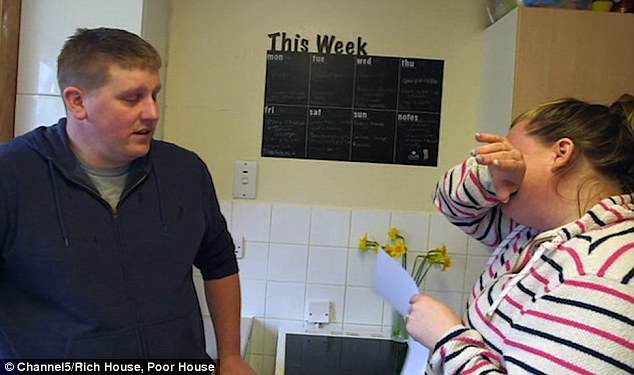 Viewers learned at the end of the show that Colin and Lizzy have paid off three quarters of the debt, and started a joint savings plan for their house deposit. During the show, Sarah and Ross explained how they began to rely on borrowing from high-interest credit cards to cover emergency spending. ‘We do have a considerable amount of debt but it hasn’t been brought on from living a high lifestyle,’ he said. Ross, who works six days a week and sometimes up to 90 hours on a shipyard, said that their monthly payments of more than £500 only just covered the interest and they hadn’t even made a dent in the £11,000 they had over six cards. Without the credit card repayments, they could easily have doubled their weekly budget. 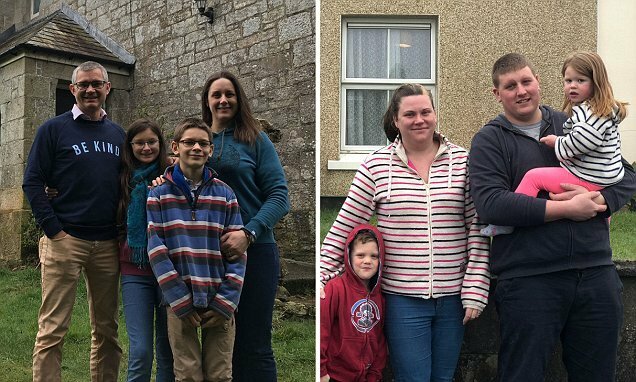 The Whitings slowly uncovered the truth about the struggle of the Timmins, speaking with their family members while staying in their house in Redruth. They had just a taster of what it was like living on the breadline as Colin, who is the director of his own surgery, found himself constantly checking on the electricity meter and worrying about how much it cost to boil the kettle for a cup of tea. 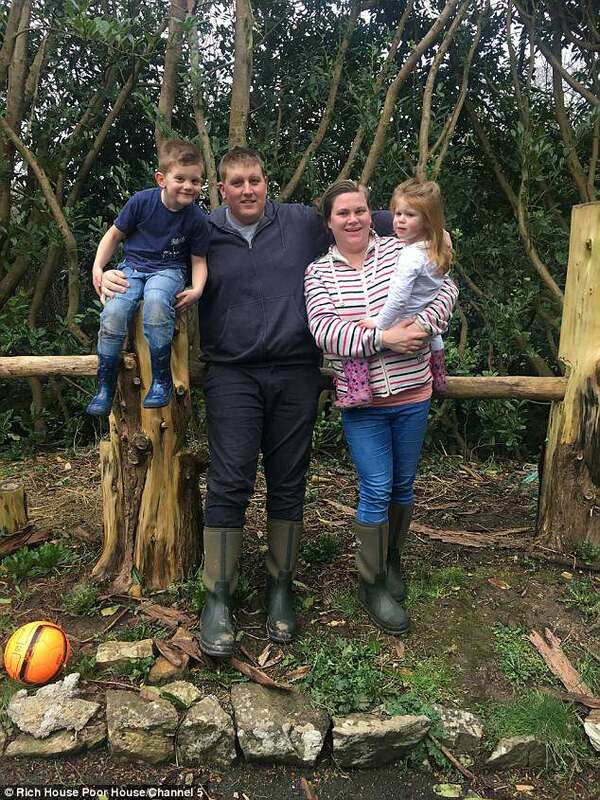 The eye-opening experience was enough for them to take action and break the rules of the swap – using their own finances to buy Sarah and Ross’s children Max, five, and Polly, two, a treehouse, as well as pledging to help them pay off their debts. 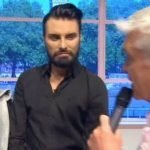 ‘Been in Ross and Sarah’s shoes has felt hard, it’s felt bloody hard. That the shortage of money is in your face just everywhere you turn,’ Colin reflected after the experience. 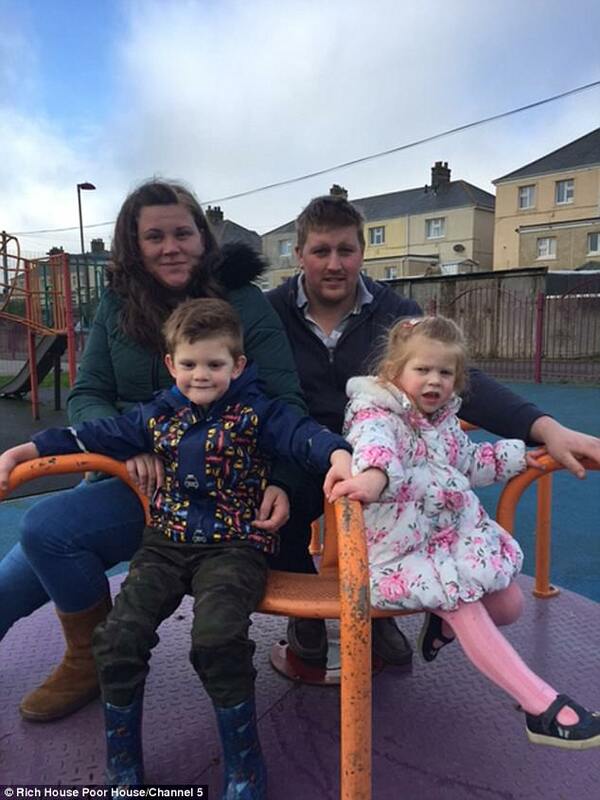 Money was a constant worry for childhood sweethearts Sarah and Ross, which had put a strain on their own relationship, as they tried to provide for their two children as well as run a home and stay strong as a family. ‘We’re only a pay check away from being in trouble aren’t we?’ Ross said. But the week they were able to live carefree without the strict need for budgeting. They enjoyed a day trip to the Eden Project – the cost of the trip being three quarter of their usual budget – as well as treating the whole family to a spot of ice-skating, followed by burger and chips at a cafe on site. The couple also treated their children to new toys worth £90 on a shopping trip, and pampered themselves at the hair salon spending £80. 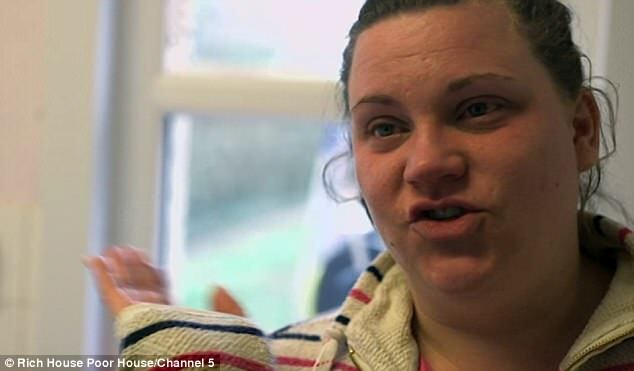 And after spending £100 on a romantic three-course meal for just the two of them, Sarah said: ‘With the reality of family and debt, you forget, you tend to fall out of love. 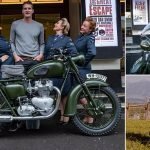 When Sarah and Ross, who hadn’t had a holiday since their honeymoon in 2014, discovered the letter at the home after their week away in the countryside they couldn’t believe their luck. ‘For a family to have stepped in our shoes and offer the gesture that they have and never actually met us is something that I never really thought existed,’ Ross said. ‘It will be life changing. It is a dream,’ Sarah added.